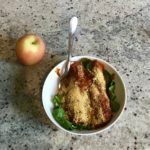 I posted a day of eats back in March that gave a “behind the scenes” look at what I was thinking/feeling as I made food choices through the day and the feedback I received was that many of you found it really helpful in your own intuitive eating journey. I often hesitate to do a “daily eats” post (after doing them for a long time) because I don’t want to sent the message that this is how you should eat. No two bodies are the same. So the way we eat, move and look will never be the same. All that to say, I hope reading about what went into making a food decision helps you in your own intuitive eating process. Or if you’re unfamiliar with intuitive eating or new to intuitive eating, I hope this is resonates with you in a way that might spur you on to learn more. I’d love to hear your thoughts in the comments! 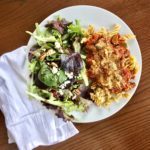 When I first began practicing IE, food decisions required a lot more thought and attention as I figured out my body and figured out what the heck intuitive eating even meant. That’s normal in the beginning of this process. If it feels uncertain and shaky, you’re in the right place. 🙂 In the beginning it feels hyper focused as you learn this new skill. Over time though, the decision making on what to eat becomes more subconscious and intuitive, where now years later it might take me 30 seconds to figure out what to eat. If it feels hyper focused for you right now, that’s okay. You’re right where you need to be in your journey. Lately, I’ve been waking up, eating something and then most mornings going outside for some fresh air. The mornings have been so beautiful here. At least most mornings. It’s not hot yet, the breeze is cool and not many people are out. I stroll the streets, listen to music, do some praying and try to clear my mind –> key work is try. This doesn’t happen every morning, but I’m realizing when it does I feel way less frazzled going into the day. So yesterday I ate a banana, drank some coffee and headed out on a stroll. Sometimes I might eat yogurt. This isn’t a “ohhh, I’m craving that” food decision – it’s just more habitual to get something in my stomach. 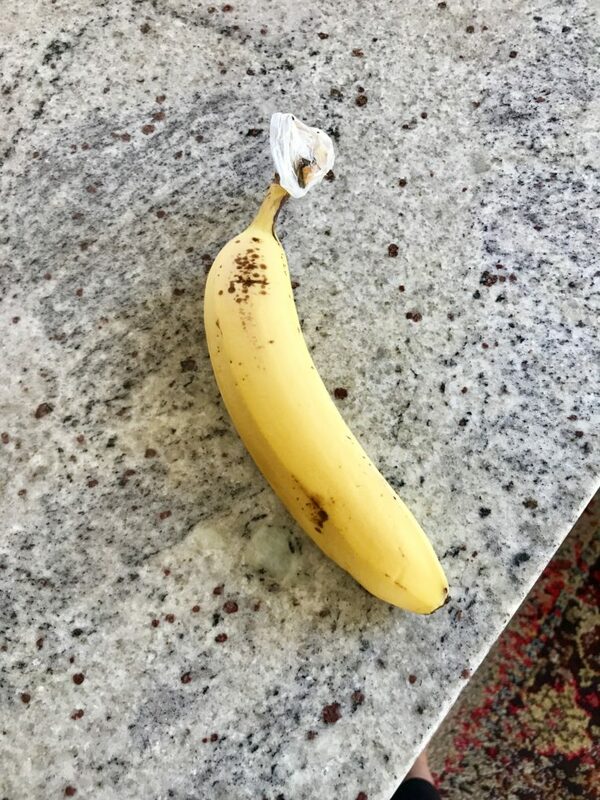 A banana or yogurt are convenient and enough to tide me over for 30-45 minutes. While I was walking I had a mega craving for an egg and cheese sandwich. With the weather getting warmer, I feel like that’s thrown off my morning appetite. Sometimes all I want is a bowl of cereal, but that never keeps me full for long. Today, I had a craving so I hopped on it. I wasn’t craving anything sweet and all I wanted was savory. 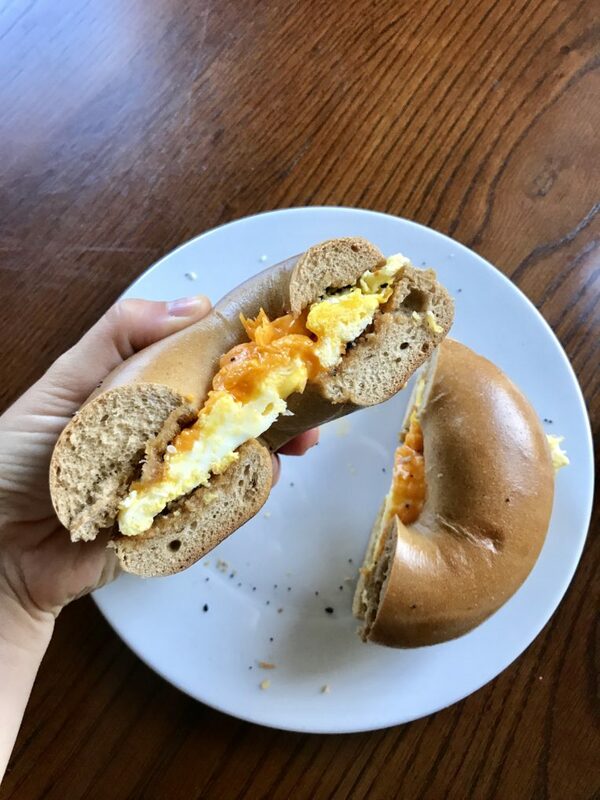 I almost stopped to pick up an egg sandwich because that’s really convenient, but I knew we had eggs and really good cheddar at home so on my walk back I picked up a bagel from the local coffee shop for $1.60 and headed home to whip up a breakfast sandwich. I was really hungry and hunger hit me fast so I knew I needed this to be hearty. So I toasted up the bagel, scrambled a couple eggs because I don’t like runny yolks when I’m trying to eat a sandwich and grated lots of sharp cheddar. I wanted it to be really cheesy. And then since I was really craving savory, I buttered the bagel when it was done toasting and sprinkled on lots of TJs everything seasoning. HIGHLY recommend buttering the bagel – it made this egg sandwich 100x better. I think they do that at restaurants which is why egg sandwiches are so much better eaten out…maybe? Bagel = carbs. Eggs + cheese = protein + fat. Butter = fat. As I was eating this I got about 80% of the way through and felt myself feeling full but it was so freaking good that I wanted to finish it. Finishing the sandwich left me a teensy bit over optimal fullness, but that’s fine – I knew that meant I probably wouldn’t need a morning snack. Breakfast held me over for a good 4 1/2 hours and then I took a break from seeing clients for lunch. We are low on groceries this week so meals have been a little unconventional. This is a situation where I’m probably not going to have the most satisfying food experience and that’s okay. Intuitive eating isn’t about always having the most epic meal. The cool part is that with IE, the next time you eat you get to having whatever you’re craving so one meal isn’t the end all be all. When I thought about what sounded good – the options where a salad with rotisserie chicken, cheddar, veggies, almonds, cranberries and dressing or eggs + cheese with salad. I didn’t want a big salad. Usually I don’t crave the same thing twice in a day, but yesterday I did so I rolled with it. If you’re someone who thinks you can’t eat the same foods twice in a day (common foods I hear are peanut butter, bread, pasta, cheese, etc) I’m going to encourage you to challenge that thought. What will happen if you do? Where do you think that belief originated from? What makes that belief true or untrue? I scrambled up a couple eggs with sharp cheddar and made a really basic “salad” which was mixed greens + olive oil + balsamic + sea salt. Plus strawberries for some sweet flavor. I knew that lunch wouldn’t be enough. It had a good amount of protein + fat from the eggs, cheese and olive oil but was lacking in the carb department. A few strawberries doesn’t cut it. And for me, I find that having fruit as a carb source in a meal usually doesn’t satisfy me. I need a potato or a grain. After eating it I was probably a six on the fullness scale and only like 70% satisfied. I had a lot of writing to do that afternoon and whenever I have a lot of writing to do I like to munch on something. Popcorn it was. Salty + savory + carby which is exactly what I was craving. 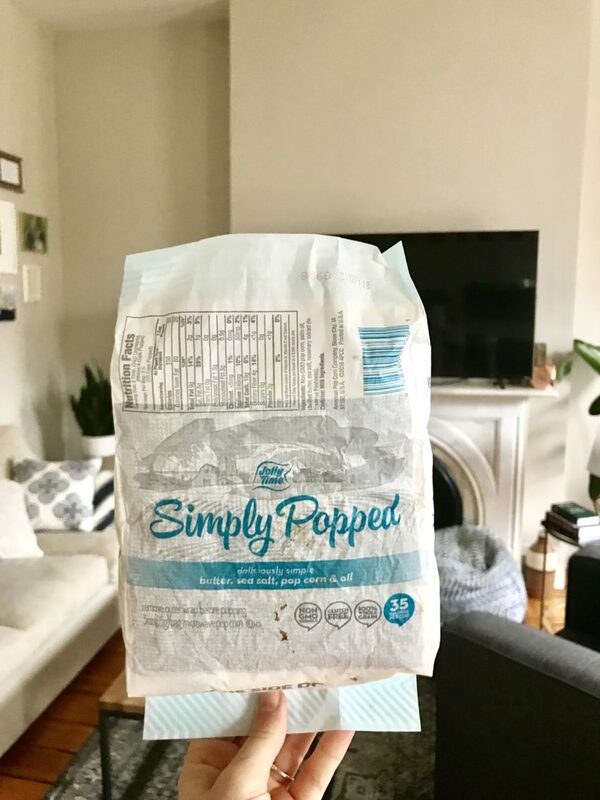 I ate this bag of popcorn over the course of a hour or so, minus the few handfuls Nick stole when he smelled it from my office. If I eat a solid lunch, I usually don’t get hungry or think about food for a good 4ish hours. If you find yourself still thinking about food after eating a meal where you feel full, take a look back and think about how satisfied you were. Or did you feel a bloated type of full from a lot of veggies/fiber or a sense of satiation from a well rounded meal with all the macronutrients? Often too, if you’ve been restricting food (even slight restriction) and not eating enough, your mind can often feel hungry even if you feel like you’re nice and truly full. That’s okay. In the journey towards becoming an intuitive eater, the body heals before the mind does. When I started to feel distracted with my work, I knew that was a sign of hunger and then my stomach felt empty. It was in the high 80s yesterday so cold + creamy is what I was craving. 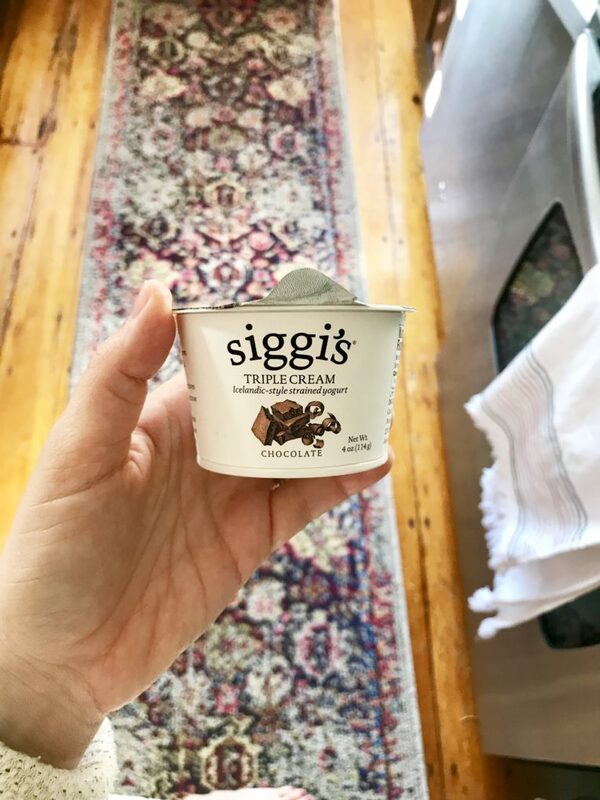 I grabbed a Siggi’s triple cream yogurt from the fridge. 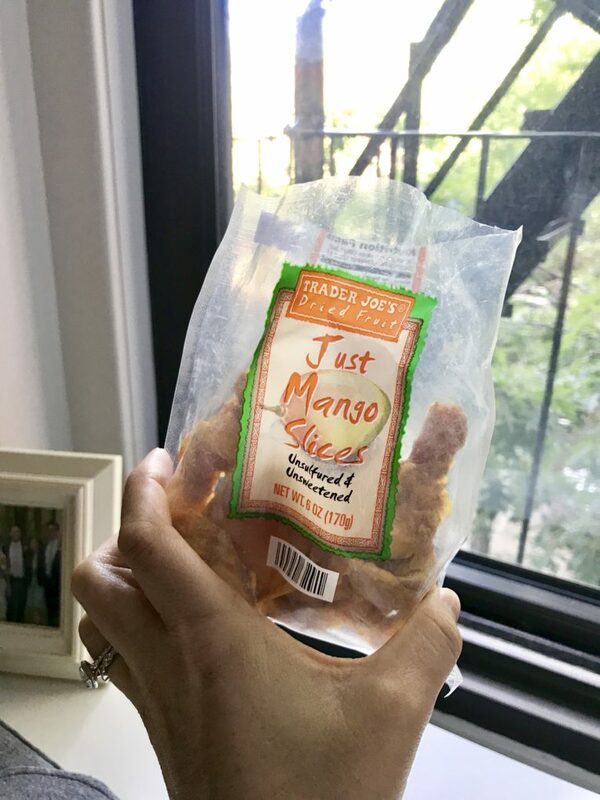 And then snacked on some dried mango in between the Thursday Instagram live Q&As I do and the Q&A sessions I do for my online course. In the afternoon, unless I have a good 3 hours before dinner I don’t like to get “meal full” – so I usually snack in a way that keeps hunger at bay, but I also don’t feel full and satisfied like I would after a meal. The yogurt is made with cream and whole milk so it has a good amount of fat + protein to hold me over. I usually wouldn’t eat the mango by itself unless I was eating a meal in 30 minutes or so because although mango is super tasty and a good source of quick energy from the simple carbohydrates (my brain felt like it was dragging a bit yesterday so I thought some simple carbs would give me a little jolt ha) it’s not going to really satisfy hunger for long. But pairing it with fat + protein, this snack held me over until dinner without getting me too full. This week I made spaghetti with meat sauce for dinner so we reheated those leftovers. All I did was brown a pound of ground beef that I added a jar of marinara to and then doctored it up with italian seasoning, crushed red pepper and a hefty spoonful of brown sugar. My mom use to add brown sugar to meat sauce and it makes it extra tasty. 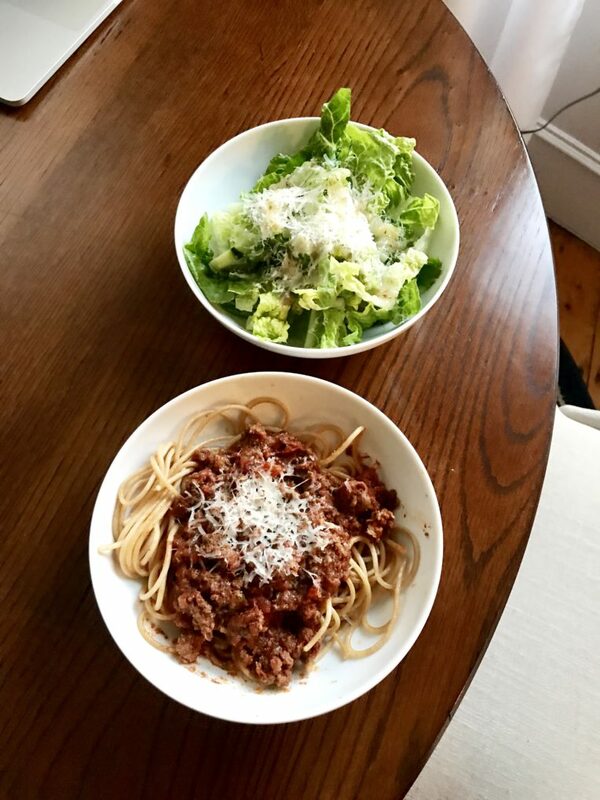 We ate the sauce over whole wheat noodles with parmesan and had a super simple salad on the side – romaine, cucumbers, parmesan and greek dressing. 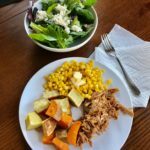 Meal planning and wanting to eat intuitively isn’t perfect. I wrote a post on how I go about that here. I really enjoy the convenience of having something already made, but that doesn’t mean that it’s going to be 100% what I’m craving. This was probably 75% of what I was craving. To feel satisfied, I eat a nighttime snack that is 100% what I’m craving. I was pretty hungry before eating dinner (probably a 3ish on the hunger/fullness scale) and afterward was about a 7ish. Sometimes I overshoot at dinner and end up closer to an 8, but most of the time I try to be mindful and get to comfortable fullness. I say that because intuitive eating isn’t about getting it right all the time. That’s impossible. It’s about doing the best you can to listen to, and therefore care for your body. Usually about an hour or two after dinner is when I’ll have a snack. Usually it’s ice cream or a baked good or something like that. I’m not necessarily hungry for this snack but it serves two purposes 1) satisfaction and 2) tops me off so I don’t wake up in the middle of the night hungry or wake up in the morning starving. I hate waking up and feeling like “I need a hearty breakfast right this second!” because I like to drink coffee and go on a walk before breakfast. I most often eat ice cream. I use to feel insane around ice cream. It was one of those foods that I felt like I had no control around. 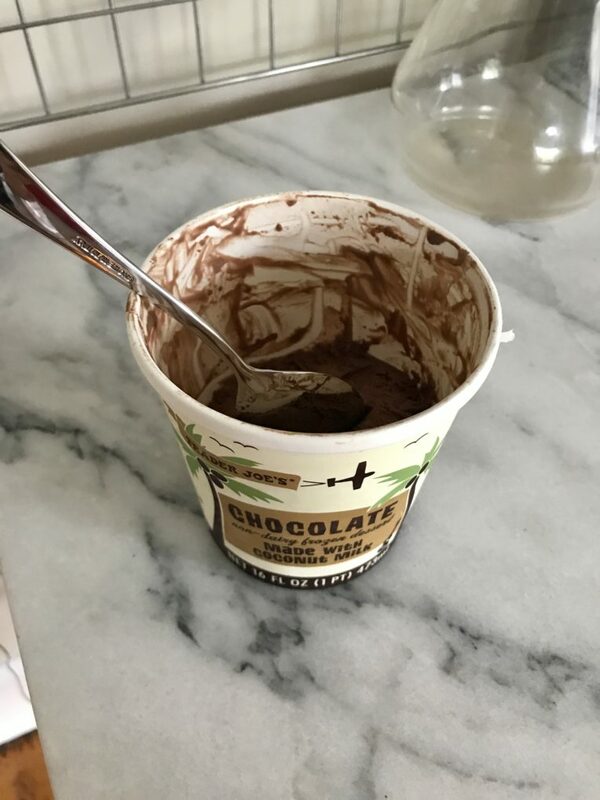 It took a lot of time and plenty of times where I ate too much ice cream, but years later I find that incorporating it regularly into my eating has made me feel totally competent around ice cream – for me, ice cream now it the equivalent to a salad. I can say no or yes and eat it whenever. But that was a long time in the making so I hope that encourages you to stick with this journey. Sometimes I eat Breyer’s, sometimes I eat this TJs coconut milk, sometimes I eat Ben and Jerry’s and sometimes I eat Nada Moo. We keep a variety on hand in the freezer. Remember, intuitive eating certainly isn’t perfect, it doesn’t look the same for everyone, and it’s an ongoing process of learning to care for your body in different seasons of life and under different circumstances. I’d love to hear in the comments where you’re at with intuitive eating (maybe you’re like, Robyn what the heck is intuitive eating?) and what you’re learning. Happy weekend! I have been reading your blog for a long time now and have found it so helpful in my ongoing recovery from anorexia. I’m in a good place now but recently was a bit thrown by a dentist visit where the dentist told me I should stop eating snacks because snacks increase the acid in your mouth and aggravate tooth decay. 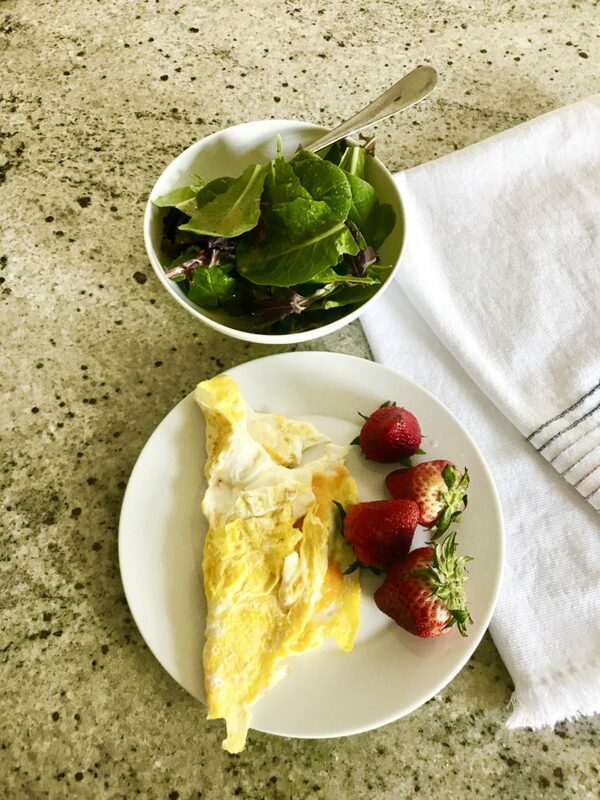 I’ve always been a grazer and feel best when I eat little and often rather than 3 big meals, and in addition to this I’ve kept loosely to my old meal plan from ED treatment which includes 2-3 snacks a day. Now though, I’m feeling really guilty about snacking and thinking I should stop… could you tell me your thoughts on balancing the dentists’ advice with what I know is good for other aspects of my health, physical and mental – aka IE and frequent snacks? I think one of the things I struggle with most is that, being early on in learning to eat more intuitively without restriction, I often have decision fatigue from trying to choose something to eat. I sometimes get overwhelmed by the options and can’t discern what I’m actually craving and need in that moment. Do you have any advice for this? I struggle with the same issue you do. Please take my answer with a grain of salt, as I am not a professional, but I found having a few options for each meal to be immensely helpful. For instance, I usually have 3-4 meal ideas for breakfast and depending on what I’m doing that day, how hungry I am, how much time I have ect, I’ll choose one of my meal options to eat. I have found that immensely helpful. I can save my decision making for when I’m eating out or if I’m food shopping. I sincerely believe life is more than food (the whole point of IE!!) and having these meal options ensures that I’m getting the nutrients I need, honoring my cravings in the moment, but not wasting a lot of energy (and anxiety!) over the meal. I am an athlete so I can’t always honor my fullness and hunger cues, so maybe this approach totally goes against IE philosophy. But, it’s helped me a lot and ensure I don’t backslide into disordered behaviors. I too am not a professional, but have definitely struggled with that in the past. I still do sometimes, but nowhere near as often. Now I might have that feeling once a month or so. Firstly, I found it just takes time. Lots and lots of time learning to listen to your body gently and forgiving yourself when you get overwhelmed. Next, I found it handy to experiment with finding foods that I knew would satisfy me and I could default to them when I felt too frazzled to make a decision. Interestingly, some of those ‘go-to’ meals and snacks were hugely challenging, but hey, nothing like repetition to overcome that guilt and fear! Don’t worry too much about it, I think that’s a really normal thing to feel, and time and practice are key. This all looks amazing! I’m curious- have you done a post on coffee yet? I hear so much negative stuff about caffeine- how it whacks out your hormones and stuff- and since I’m trying to “heal my hormones” right now I’d love to hear your thoughts on drinking it, especially on an empty stomach in the morning. Thanks!!! I don’t read studies about coffee/caffeine since they seem to conflict with each other so much, but I can offer some anecdotal advice. My hormones were disrupted for many years and I did not need to alter my caffeine intake to restore them. I have almost always had 12-16 ounces of coffee per day (starting on an empty stomach) and have not had any negative side effects. My body lets me know when I have too much caffeine by becoming anxious and jittery. I also continued this amount of caffeine intake through two pregnancies and nursing with no side effects. You can probably just experiment with what works for you, but unless your body tells you different, you’re probably not causing any harm by having caffeine! I read this post before breakfast and instantly became starving lol. Just ran out to Trader Joe’s for supplies and made the egg/cheese on one of their PRETZEL bagels…umm…yeah. Whoa. Thanks Robyn, have a great weekend! So many amazing points in here. Though I have been following your posts for a while it feels like I am still always making more realizations and that there is still a lot of intuition left to be gained. Your point about having specific foods twice in a day is definitely one of those things that would have terrified me a year ago! Now I have been working on finding that line of satiation before getting too full, and I haven’t stopped to look at bloated full vs satiated full. I definitely find myself with hunger cues 2 ish hours after many meals, even though my meals leave me full. Definitely a next step to help me move forward! glad this post gave you some points to ponder and process through Joelle! So much amazing information on this blog! I just recently started following you and I can say that your intuitive eating posts have helped me so much. 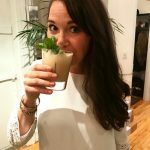 I got into blogging (site: fuelingforsoul.com) because of the struggles I have had with recovering from anorexia bulimia. Seeing what an RD is able to eat along with thought processes has encouraged me to add fear foods back into meal plan. I haven’t ate “intuitively” for so long I don’t even know where to start sometimes so thanks again! so glad this was encouraging for you Carly!! I was thinking about you and the IE philosophies you share yesterday when I had an amazing adventure paddle boarding with my college age kids. Afterwards they wanted to go to a burger place that is iconic in the city where we live. I would typically choose a salad with added protein or find a grilled chicken option but you always suggest we enjoy the moment so I got the burger and shared the truffle fries with my kids. I havent eaten a commercial burger or french fry in years. We sat outside and ate our burgers and I left comfortable and just so happy to have that time with my kids. Intuitive eating at its best right there. Huge thank you for helping me get there. this made my day to hear your victory Nancy! What an example of eating in a way that enhances and experience! These kinds of posts are very helpful! One area I struggle with is routine. Maybe at first I genuinely want ice cream every night but at a certain point it becomes unclear if I still do or it’s become an action based on habit/routine. Certain foods will always sound good when offered/available but that doesn’t mean I’m craving it, you know? yes I hear you – there is so much nuance with IE. For me ice cream is a bit routine and I find it comforting and satisfying – but there are days I don’t want ice cream and instead reach for dried fruit, a cookie, sour candy etc. It’s all so flexible! LOVED this post! I found this extremely helpful as I navigate my own IE journey. More of these posts please! These are some of my favorite posts! I love how you talk about your thought process behind your choices (and it’s a thought process of freedom and not restriction). It encourages me to continually re-think some of my self-imposed food rules and eat intuitively. Keep these “day in the life” posts up! glad these are helpful for you Abby!! I absolutely love how you talk about the hunger/fullness scale, because I appreciate you encouraging us that fullness is GOOD and it’s not a bad thing. I love that you are at that place where you don’t beat yourself up about being overly full and you just wait till the next meal, which might be later or earlier. The flexibility of intuitive eating truly is SO freeing; it’s scary but freeing!!! These posts are amazing Robyn! I love these posts! I like the reinforcement that IE isn’t all about meditating on what food would be the best any time you eat because obsessing over it is no different than the “mindfulness diet.” I do have a quick question though. I have been a vegetarian for around 12 years( I have family in the meat industry and my decision was not based on restriction but from being affected mentally by what I saw. I don’t mean to be triggering or offensive to anyone if this is!) I have always been a hearty eater and used to eat huge salads (with lots of fats and carbs) for lunch because I craved them. Lately though I have been becoming very bloated and uncomfortable like sick to my stomach after a salad of raw vegetables. I know some dietitians do not agree with vegetarianism for fear of restrictive habits but if that’s not the case at all with me, what could be underlying issues with gas/bloating/ gastric issues that become painful with this now? Hi Savanna – I will never be able to do GI issues justice via comments but I do think there are a few things to consider that I hope are helpful! Is the quantity of raw veggies too much for your digestive system? Is there enough variety in your day to day? Those are a couple things to think about that might be helpful! I love that you talk about fears of eating the same food twice in one day. I also had fears about eating two different types of food in one day. I used to think that if I’d already had 2 tbsp. of nut butter I couldn’t have more, or I couldn’t have cheese on a salad at lunch because I’d eaten a half of an avocado with breakfast and it was too much fat. I thought I couldn’t eat beef and coconut on the same day because of the saturated fat. So glad I have ditched those rules. They made eating feel impossible and so stressful! Happy to report that I had eggs, cheese, butter, AND coconut milk ice cream today and I have no regrets. so happy for you Ann and these big steps forward for you Ann! As always, I so appreciate learning from you and your posts on intuitive eating! I have grown so much personally and professionally in the past 9+ months…which is so helpful with my own patients/clients as an RD! So glad to hear that Audra! Ice-cream is one of the hardest foods for me and one of the few that I can’t seem to Legalize no matter how hard I try! It always seems to be associated with restriction and guilt and binging. A tub nothing! Any tips for starting out on this particular food?! Maybe start with stuff that is portioned for you? Like ice cream sandwiches, or Ben & Jerry’s sell containers smaller than pints with one serving. Flavors are limited, but the ones they have are tasty! Once you have a handle on eating those without guilt, move on to pints. Thanks Andrea, I had never thought of that but actually it makes a lot of sense! I believe, for some strange reason, that I am scared of the pint! that would totally depend on your personal circumstances – I talked through this in my Q&A Thursdays last week so come back and ask again! Thank you for another walk- through a day of intuitive eating. It is so very helpful to me in this new journey . Even the timing and references to rating your hunger clarify issues that I wonder about these days, as I am learning. Please continue to provide this type of post- so many of us need the specifics of your thoughts as we learn to eat intuitively and to let go of a restrictive type of eating. I’m so glad you’ve enjoyed these posts Nancy!! Yes to sugar in meat sauce!!! Makes it soooo delicious! Glad to hear we’re not the only ones that do this! Oh man that egg sandwich! Unfffff! Thank you for this post; I found it super relatable actually. I also do the thing where I’m like okay I’m full, but def not satisfied, oh right that’s cause I had no carbs, okay lemme grab a few handfuls of granola. 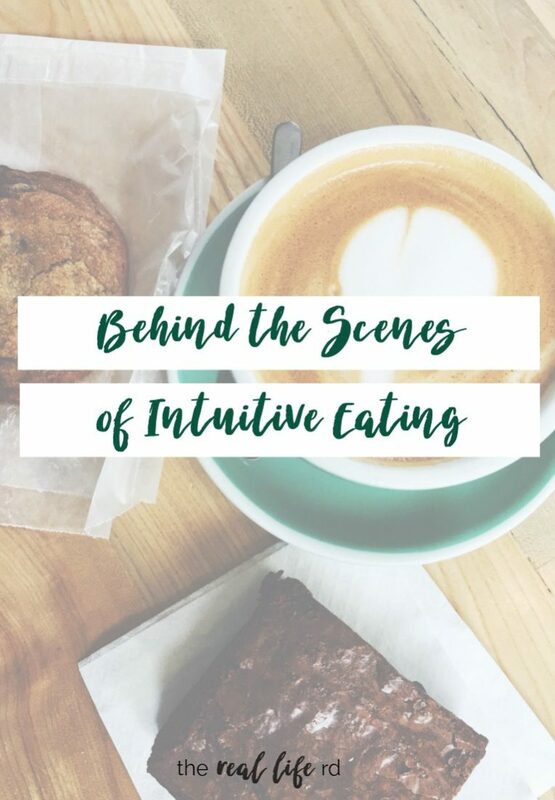 I love that intuitive eating is both about listening to your body’s hunger cues but also mentally understanding what it needs, which does come with practice. Thanks for a great post! One thing I have noticed is that sometimes I eat to fullness/satisfaction and I don’t finish the plate. This doesn’t happen all the time but when I do, I do hear my ED voice almost priding that I didn’t eat the whole thing. I just try to acknowledge that it’s a thought and move on. Just wondering if you or anyone has some advice. Thanks! I think that can be normal to hear that voice – can you dig in and explore what feels prideful about that? Does that resonate with your healthy self? If not, how can you reframe that? Love these posts. They show what real life IE is really like. Many times I see ED sneaking into peoples’ IE journey by convincing them that IE is eating perfectly in tune with their cravings etc. Love your blog! yes agree with you here Jenn, it can certainly be twisted into a diet like way of eating. Love the post, very informative and helpful! I was wondering if in these cases, would you need to realize that it’s just your mind talking, and to focus on your actual physical hunger instead of listening to your mind? Would the correct step in this situation be to be aware that you are “[physically] nice and truly full” and not continue eating? It’s definitely difficult sorting through physical and mental cues after restricted eating. I love that you shared this! I am a dietetic intern and one thing I have found is that people think RD’s eat “healthy” all the time. The funny thing is that I love food and don’t ever want to restrict what I eat. I guess I’ve learned intuitive eating although I never thought about it until recently. Thanks for sharing this information, it’s a refreshing change! I love this! I would love for you to do a post on how to actually identify if you are undereating/still restricting. I’m not sure I am – I have my periods back but cycles are quite long (33 days) – I still suspect that I may be undereating and not quite at my set point. I love this new style of WIAD! It’s WIADI now! Also, I just wanted to let you know those original posts you had about what you ate in a day helped me so much early on in my journey. I can understand why you’re hesitant now about posting a running tally of what you ate with no explanation, giving the non diet approach. However, when I first stumbled on your blog, I was very much wrapped up in a 1200 calorie a day mindset. I was AMAZED at how much you were eating and your message to eat more, not less. It was the first spark in my journey to intuitive eating and trying to figure out why you “could” eat so much more than me? It really opened my eyes into how much I was depriving myself and how much better my body could run with more energy. 🙂 I wanted to let you know it helped me, even though perhaps I know now that isn’t quite your style. I like the new WIADI even more!